Eric Willis is 7 year old 2nd grader at Cornwall Elementary school at Lee Road, Cornwall NY; he has studied violin for 3 years. His teacher is Donna Kushner. 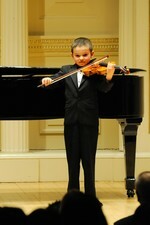 He has tested at NYSSMA for two past years and was evaluated at 27 out of 28 maximum at levels 2 and 3 in violin. He has participated in international violin competitions and placed in both. For one of them he performed at Carnegie Hall on March 25th, 2014, and for another he performed twice at the Engelman Recital Hall at Baruch college on March 30th and May 16th of 2014. This past Sunday, April 5th, he performed again in Carnegie Hall in connection with his placement in the American Protege music competition. Eric frequently plays at Waldorf school in New Paltz, Bach festival in Cornwall NY, as well as Thanksgiving concerts at Case Chapel of the Reformed Church in Poughkeepsie, NY. Eric recently enjoyed playing at his grandmother's church in Ohio during Christmas services and at his cousin's wedding.